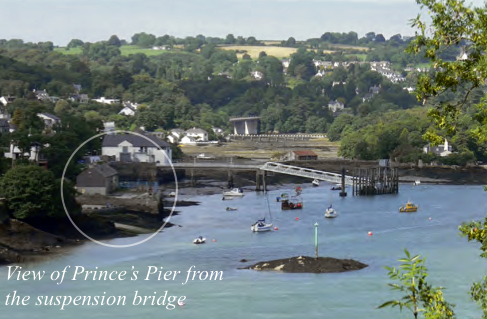 Prince’s Pier, which is being developed by Menai Heritage to house our museum, was the heart of the busy maritime endeavours of 19th century Menai Bridge. Activities ranged from the ferries across the Strait in the early part of the century, through shipping of goods around the world, to increasing tourism into the 20th century. 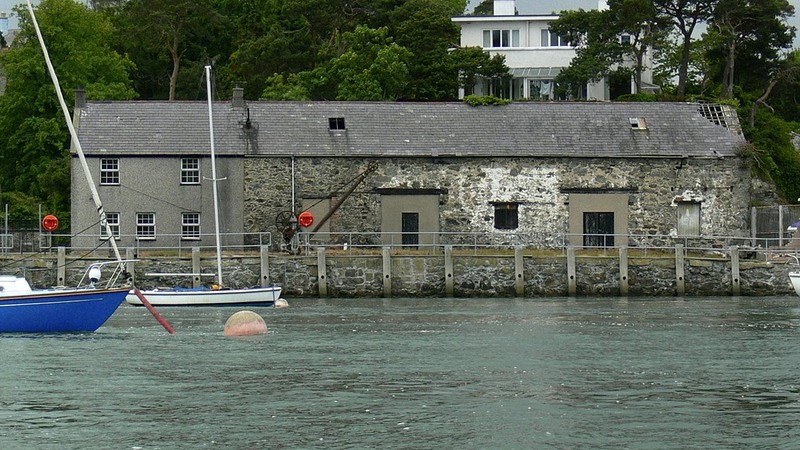 Before construction of the Menai Suspension Bridge began in 1818, the area that is now the town of Menai Bridge was primarily common land, with a handful of buildings along the strait, including the ferry house (now known as the old Cambria Inn). This was the site of one of the several ferries that had crossed the strait since medieval times. The beginning of construction saw the influx of large numbers of labourers, and with them the need for shops to supply groceries, hardware and other goods. Llangefni general store keeper Richard Davies spotted a business opportunity in the burgeoning population. The goods needed to be brought in and stored before distribution, and this area of the Strait shore had plenty of land suitable for building. In 1828 he obtained a lease from the Marquess of Anglesey for land on what is now Water Street. Initially a warehouse was built on Water Street itself. This building, recently refurbished, is near the Liverpool Arms pub. Goods were brought up to the warehouse from the small landing places of Porth y Wrach (still used today for launching boats) and Porth Daniel, at the start of today’s promenade. After about a decade Richard Davies’ son John, who was by then running the family business, expanded operations and built a wharf on the land between the two ports to accommodate larger ships. The Prince’s Pier warehouse and pier master’s house were built sometime later, probably the late 1840s or early 1850s. 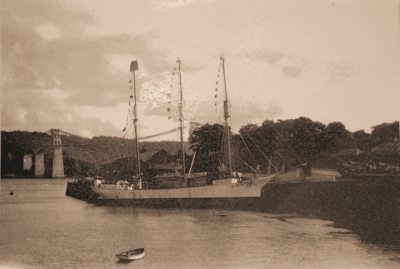 Part of John Davies’ business expansion was to take shares in a number of locally built ships. These brought in timber from North America (which was processed by a steam-powered saw mill that he also built), as well as other goods. In 1843 the Davies family bought their own ship, The Chieftain, built in St John, New Brunswick, Canada. Initially bringing back timber from Quebec, it then took slates from the North Wales quarries, as well as emigrants looking for a new life, to New Orleans and other ports along the Gulf of Mexico. Over the next few years the Davies family bought 11 more ships, making numerous journeys back and forth between Menai Bridge and North America. However, as the Davies shipping empire expanded to wider destinations such as Peru and Australia, their use of other ports around the UK also increased, and shipping activity from Prince’s Pier began to slow down. By the 1860s very few large ships were carrying goods from and to Menai Bridge. The last large ship from the Davies fleet to use Menai Bridge was the Lord Stanley, which brought a load of Quebec timber in 1868. Soon after this the City of Dublin Steam Packet Company began to develop the area to accommodate steam ships that were plying the North Wales coast from Liverpool. By this time an iron pier had been built off the Davies wharf, thus providing easy docking for the steam ships. It was used until the new St. George’s pier was built in 1904. 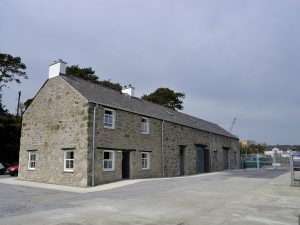 Prince’s Pier was also still used for smaller ships bringing in timber to the timber yard at Porth Daniel and other goods, stored in the old warehouse on the wharf. During the Second World War Prince’s Pier was requisitioned by the Admiralty as a base for boats patrolling the Strait, with their occupancy continuing until 1959. After this the warehouse was occasionally used for plant maintenance and the northern end of the wharf for the timber yard and, after its closure, a boatyard. Notwithstanding, the wharf and warehouse have retained much of their original historic character and contribute very significantly to the atmosphere and character of this waterfront landscape. The immediate proximity of other structures of similar date and related function and the historic depth of the landscape within which these structures sit, contribute very considerable group value to the wharf and warehouse. His recommendations for restoring the building to uncover and retain the original features have been taken into account in the recent restoration undertaken by Menai Heritage, Menter Môn and partners. The historical character of the building will enhance the heritage experience as we develop the site into a heritage centre and community hub.